It’s a new show for Easter in the Midlands. All Fools Car Show at Whittington Castle (near Oswestry, Shropshire). Finch Foundry Sticklepath, Okehampton Area 12. Rendezvous Sourton Cross ‘Little Chef’ 9.30am. Why not come along for a first trip out of the year. It’s an interesting little show and the foundry has working demos of how the farming/gardening hand tools were made. It’s a National Trust property but non-NT members will get in with their Panther for free. Register via the NT Finch Foundry website. Contact Andy Graves if you want lunch in the Taw River Inn. Bank Holiday Monday, Area2 + 10. We will be displaying at this show in Macclesfield again. 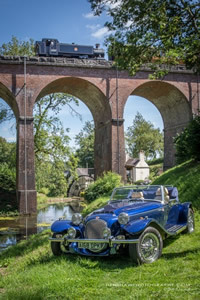 While this show is now for pre-1975 vehicles, as a long term supporter of the Show the Panther Car Club has a special invitation so we will be in our usual place among the bluebells. Admission from 10am £5 per person. stopping at Toledo en route to Salobrena Southern Spain, and returning via Toledo, Segovia and the ever popular Del Oso hotel . At the home of Geoff and Sue Booth. Rendezvous in car-park at Torpoint Sainsburys, behind the ESSO Filling station at 13.00 for a shortish scenic drive to the BBQ. please contact Andy Graves for details. No club stand arranged but members may like to attend individually. I am going to book a club display at this show in Norman Park. If anyone would like to attend this large show and be part of the Panther Car Club display, then you will need to book in with me. In all there are over 3,000 vehicles on display. Once again we will have the tea tent in action. At 1.00pm we will be having the popular bring a dish buffet lunch all together. If you would like to be part of this great event the discounted tickets cost £7.00 for car, driver and passenger. I would like to book our stand in March so please let me know ASAP. I can of course take bookings after this date, but I cannot guarantee that you will get a place. For further information on this show, or to book your ticket, please give me a ring on 01689 852250 or email:membership@panthercarclub.com. There is no club stand at this event, but you can go as an individual. British Iron Works Rally. Oswestery, Shropshire. Mt. Edgecumbe Classic Car Show & Country Fayre Sun. Area 12. Registration is online. Details T.B.A. This show has gone from strength to strength and we always have a lot of visitors to our pitch with an interest in Panthers. There is a fee per car, usually £5.00 the proceeds going to local charities. A classic car treat and vintage fun for all the family at Stafford Castle on 5 August from 11am to 5pm. 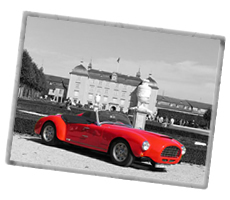 Classic, vintage and collectors cars on display, with trophies awarded to best car in class. With children's games, quizzes and children's activities. Including mini Landrover rides. Vintage cycles, auto mart and craft stalls. See Stafford's very own vintage car 'the Autocrat; (by kind permission of Perkins Engines). Severn Hospice/Attingham Park Rally. Shrewsbury Shropshire. Cranleigh Lions Classic car Show Area 1. This is a lovely little free show with an ecletic mix of classics and this year it will be classics only via a windscreen pass. Proceeds from visitors to the show go to supporting various projects in the village. now our 8th year. Please support us we have raised over £20,000 for our charities St Ann’s Hospice and Tommy’s. Admission from 10 am. £5 suggested donation. I’m considering a trip to Brittany in September and I’ve contacted Brittany Ferries for a price. They’ve extended the 20% discount period until the 13th.Feb. The trip would be from Plymouth on September 6th. returning to Plymouth on the 10th. The discounted cost comes out as £445.30 for 3 nights in Vannes staying at the Quality Hotel la Marébaudiere. This includes the ferry crossing in a Pont-Aven Club4 cabin on the way out, your car, two people and B&B in the hotel. Parking is private and free at this hotel. The cost can be reduced by opting for an inside cabin on the Pont-Aven. The cost for a single is £411.90, although by using an inside 2-berth cabin it’ll be cheaper. If you are interested please contact me by Monday 12th. to qualify for the 20% discount. I’ll then make provisional bookings for you to confirm. Bookings after 13th. February will not be discountable. We have planned an event on behalf of The Midshires Area of The Panther Car Club for 9th September to visit Daniels Mill in Bridgnorth Shropshire. We have booked the site exclusively for the day and the entrance fee (£10.00) includes a bacon sandwich and tea/coffee and a guided tour by one of the trustees who is both extremely knowledgeable and entertaining. For the ladies - see first had how these families existed and worked in those times. For everyone - see just how beautiful and interesting this venue is. We will also undertake to photograph your car on site - FOC but can't guarantee a train on it though. Aysford Priory Classic Show, Kent Area 5. Showcasing the best of the UK classic car scene, this is one of the biggest classic car shows in the country. 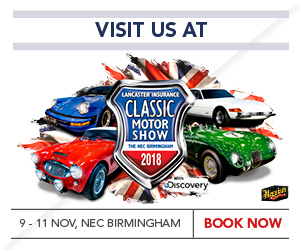 It’s packed with hundreds of motoring icons ranging right through the ages; from some of the earliest vehicles ever made, through: pre-war motorcars, 50′s, 60′s, 70′s classics and ‘future classics’ or ‘youngtimers’ from the 80′s and 90′s. 30th September 2018 Battlesbridge M/bilia Day. You will find our club code at the Forum and in the magazine! This year we will be having a party within a party at the beautiful De Vere Cotswold Water Park Hotel, near Cirencester. The evening will commence at 7.15 with a pre dinner Kir Royale, with dinner at 7.45 and disco and dancing until late. The AGM will take place on the Saturday afternoon at 3.00pm, leaving the Sunday free to explore Cirencester and the Cotswolds., or head to Bath for their famous Christmas Market. dinner, B&B and the disco, plus the use of the ten-pin bowling alley and the indoor swimming pool. Early bookings will be at the same price as 2017. You can if you wish book in directly on 01637 879292. Mention you are part of the Panther Car Club booking. PS The Area 12 Xmas Bash in Newquay is going well with quite a few rooms booked already. The number to call is 01637 879292. Come and join us. I have 7 cabins and hotel rooms on hold with 3 already taken. Late October the remainder will be released back to the hotels if not taken. Contact Kathy Venn on 01752 635371 saying you wish to be booked onto Andy’s Panther trip to Spain 2019.